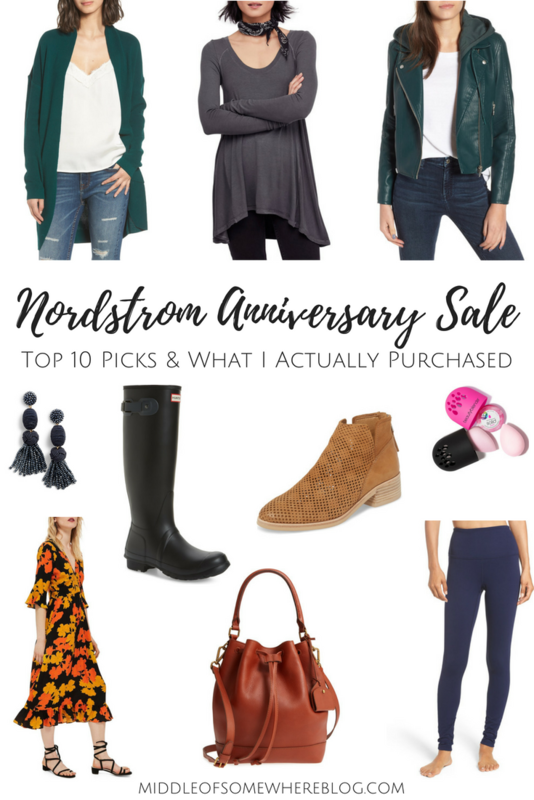 As you probably already know by now, the Nordstrom Anniversary Sale has been in full swing since last week. I mentioned on my Instagram stories (@lindsayrutland) that I was little underwhelmed by the sale, and only had purchased a few items. The first of my orders actually came in Thursday evening, which included the BLANKNYC moto jacket. The quality of this jacket is so amazing for the price (under $65!). I can see myself wearing it all fall/winter long! I am anxiously awaiting the rest of my order, and will definitely show you everything on my IG stories once it’s in. On a side note, the home section of the sale is actually really good this year. I plan to share my top 10 home picks with you on Tuesday, plus a giveaway so you can shop the sale with a little extra cash. In the meantime, my top 10 picks are below! Zella Live In High Waist Leggings – Would I even be a blogger if I didn’t get a pair of these? I bought my first pair last year during the sale, and couldn’t resist the navy pair this year! BLANKNYC Moto Jacket – I thought long and hard about this one, but knew I had to have it (and that it would sell out fast!) I purchased the black, and would say it runs a bit small. beautyblender Set – One of the first things I knew I wanted to purchase. I think it’s a great deal for 2 beautyblenders, and I love the travel case it comes with! Dolce Vita Perforated Booties – These will definitely be purchased soon! Madewell Leather Bucket Bag – The verdict is still out on this one. It’s in my wishlist for now, but the reviews haven’t been great. I originally wanted the perforated transport bag, but thought it was too similar to other bags I have. Baublebar Drop Earrings – Baublebar has been my go-to for statement earrings for years, and these are too pretty to pass up! Free People January Tee – I already own this tee and can say it’s worth every penny, especially when it’s only $31! I love the oversized fit, and it’s perfect for layering. Hunter Rain Boots – Grab them now for $50 off! I am so glad I finally invested in a pair of these. Totally worth the price, and the only pair of rain boots you need. Topshop Midi Dress – Midi dresses are my favorite, and this bold floral is so pretty for fall!